Objective: The study aims to evaluate all patients who underwent liver resection for metastatic disease for demographics, characteristics of the primary tumor and metastasis, volume of liver resection specimens per pathology laboratory and to describe trends in surgical treatment. Methods: Data were prospectively collected using the Dutch nationwide pathology network. All pathology reports containing details on liver resections for metastatic disease between January 2001 and December 2010 were evaluated. Results: A total of 3,916 liver resections were performed in 3,699 patients with a median age of 63 years (range 1-91). The primary tumor was mainly colorectal (n = 3,256; 88.0%). The number of 'high volume liver centers' increased from 2 to 12 in the study period, whereas the number of 'low volume centers' decreased. The number of liver resections increased from 224 to 596 per year (p ≤ 0.0001). A significant increase was demonstrated in elderly patients, patients with multiple metastases, liver resections for smaller metastases and minor liver resections. 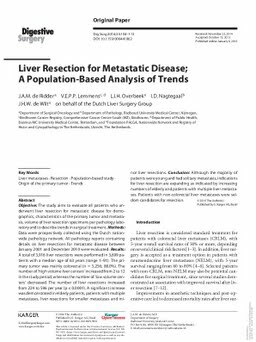 Conclusion: Although the majority of patients were young and had solitary metastasis, indications for liver resection are expanding as indicated by increasing numbers of elderly and patients with multiple liver metastases. Patients with non-colorectal liver metastases were seldom candidates for resection.